This book is the third volume in an ongoing series published by Leonaur for all those interested in the Seven Years’ war as it was fought in North America—The French and Indian War. 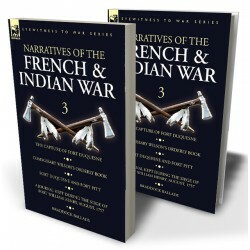 This conflict has perennially attracted students of the history of warfare because it was fought in the woodlands and upon the lakes of the New World, not only between the regular troops of France and Britain, but also including the frontiersmen and militia of both sides and their respective Indian allies. Several books have been published on this subject by Leonaur, but ongoing research has continued to unearth a wealth of shorter works which, for the most part, would be impractical to publish individually. Volume 3 of Narratives of the French and Indian War includes five essential small works including source material which will broaden the knowledge of all those interested in this fascinating subject. Washington, with his detachment of ragged recruits, without tents and scarcely armed, was at Will’s Creek, about one hundred and forty miles from the “Forks of the Ohio,” and he was deeply chagrined when Ward joined him and reported the loss of the fort. Dinwiddie then ordered Washington to advance. In order to do so a road must be cut for wagons and cannon, through a dense forest; two mountain ranges must be crossed, and innumerable hills and streams. Towards the end of May he reached Great Meadows with one hundred and fifty men. While encamped here, Washington learned that a detachment of French had marched from the fort in order to attack him. They met in a rocky hollow, and a short fight ensued. Coulon de Jumonville, the commander, was killed; all the French were taken prisoners or killed except one Canadian. This skirmish was the beginning of the war. Washington then advanced as far as Christopher Gist’s settlement, twelve or fourteen miles on the other side of the Laurel Ridge. He soon heard that strong reinforcements had been sent to Fort Duquesne, and that another detachment was even then on the march under Coulon de Villiers, so on June 28th he began to retreat. Not having enough horses, the men had to carry the baggage on their backs and drag nine swivels over miserable roads. Two days brought them to Great Meadows, and they had but one full day to strengthen the slight fortification they had made there, and which Washington named Fort Necessity. The fighting began at about 11, and lasted for nine hours; the English, notwithstanding their half-starved condition, and their want of ammunition, keeping their ground against double their number. When darkness came a parley was sounded, to which Washington at first paid no attention, but when the French repeated the proposal, and requested that an officer might be sent, he could refuse no longer. There were but two in Washington’s command who could understand French, and one of them was wounded. Capt. Van Braam, a Dutchman, acted as interpreter. The articles were signed about midnight. The English troops were to march out with drums beating, carrying with them all their property. The prisoners taken in the Jumonville affair were to be released, Capt. Van Braam and Major Stobo to be detained as hostages for their safe return to Fort Duquesne. This defeat was disastrous to the English. There was now not an English flag waving west of the Alleghanies Villiers went back exultant to Fort Duquesne, and Washington began his wretched march to Will’s Creek. No horses, no cattle, most of the baggage must be left behind, while the sick and wounded must be carried over the Alleghanies on the backs of their weary, half-starved comrades. And this was the Fourth of July, 1754. The conditions of the surrender were never carried out. The prisoners taken in the skirmish with Jumonville were not returned. Van Braam and Stobo were detained for some time at Fort Duquesne. Van Braam was at last released, but Major Stobo was sent to Quebec, where he was kept a prisoner for several years. While a prisoner on parole he made good use of his opportunities by acquainting himself with the neighbourhood; afterwards he was kept in close confinement and endured great hardships; but in the spring of 1759 he succeeded in making his escape in the most miraculous manner. While Wolfe was besieging Quebec, he returned from Halifax, and, it is said, it was he who guided the troops up the narrow, wooded path to the Heights of Abraham. Strange, that one taken prisoner in a far distant province, in a skirmish which began the war, should guide the gallant Wolfe to the victory at Quebec, which virtually closed the war in America.